Fishing with Bobber and Jigs can be an extremely effective technique for Winter Steelhead. Photo of Kiley Brehm. What is bobber fishing for Winter Steelhead? Great question, thanks for asking! This technique uses an enticing presentation, such as a jig, bead, yarn or some form of bait and is rigged below a float/bobber. This is one of the best Winter Steelhead fishing techniques. 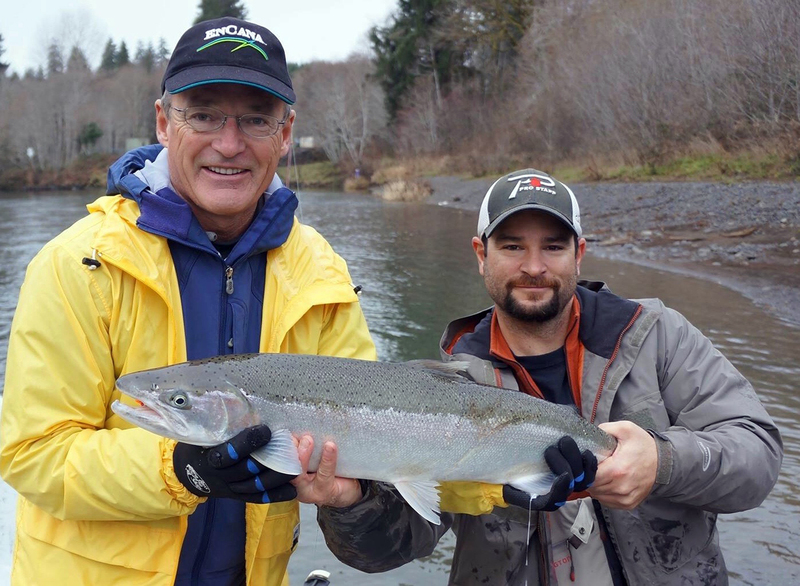 It is beloved by experienced and beginner Steelhead fishermen alike. It is easy to learn and has amazing versatility. If you want to catch Winter Steelhead, you must learn how to float fish. 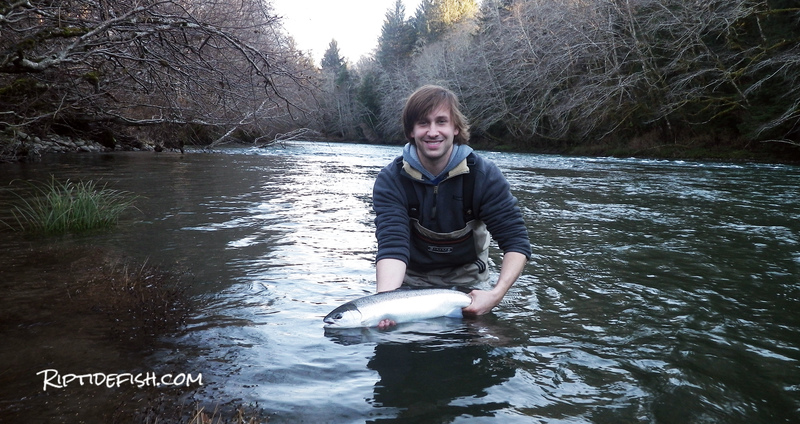 Patrick Allen with a beautiful Winter Steelhead from Washington’s Olympic Peninsula. Caught float fishing a Pink Worm. This section is about the technique that is float fishing. You will learn later in this article the “where” and the “what” of the technique. This is about the “how”. You have arrived at the river and find that perfect stretch of water that you want to fish. You have selected the place you think Steelhead are holding, and have your float rod rigged and the perfect jig is tied on. Now the technique becomes the difference between catching and not catching. The goal is to have your jig in the strike zone as long as possible. Where is the strike zone? This is where the steelhead is resting, and is usually within two feet of the river bottom. Steelhead hold here, and in the winter frigid water temps cause them to really focus on baits that are right in front of them. They usually will not move much to strike your presentation. Casting placement is the first key. You want to cast upstream of the area that you feel that they are holding. This is important because it take time for the jig to sink down into the strike zone. Line management is the second key. You are trying to allow your jig to stay in the strike zone as long as possible. The goal is to have your float riding completely vertical like the photo below. This bobber is properly weighted and completely vertical, meaning that the jig is fishing! You need to manage your line. If your mainline is extremely upriver from your float, it will hold back the setup and pull your jig up and out of the strike zone. If your mainline is downriver from your presentation it will drag your setup downriver faster than the current and also lift your jig up and out of the strike zone. The goal is to allow your bobber and jig to drift at the same natural speed of the river current. Line management is EVERYTHING. Flyfishers know this strategy as mending. If the top of your float is pointed upriver, you are holding the presentation back. If the top of your float is pointed downriver, you have way too much line downstream of your float (or your fishing too deep and your jig is bouncing off the bottom. Stop it!!! Get it together! 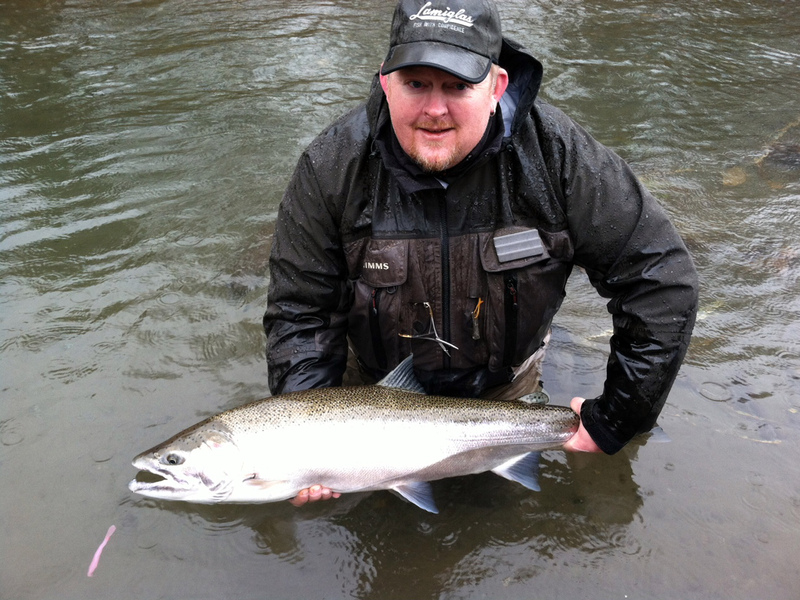 First Light Guide Service pro Mike Ainsworth with a hatchery Winter Steelhead caught on a bobber and jig. How will they expend the least amount of effort when picking a spot to hold in the river. Remembering that they still need a good amount of oxygen washing over their gills. And keeping that in mind, where will they hold where they feel like they have ample cover from predators. The faster current on the right WAS NOT where we found the fish, it was in the slightly slower currents just off of the fast water. They will only rest in the shallowest and softest portions of river if there is ample cover. Look for overhanging trees, nearby submerged logs, or when the river is high and the water is murky. They will only rest in the most turbulent stretches of river when the water is clear and they have no other place to hide. These areas include the head of a run, boulder gardens, and fast flowing stretches with a choppy surface, but usually near the edges. Most of the time, conditions dictate that they will be somewhere between these two extremes. If the water has a hint of color, they will most likely be in that walking-speed-water alongside the main current. When the water is crystal clear they might be holding in the rapid waters of a boulder garden. If the water is high they might hold along the edge of the river bank or in the slower tail out of a long run or pool. The first part of the art of Steelhead fishing is finding out where they will be resting on your day out. The second challenge is figuring out what they will be biting that day. Getting outfitted to float fish for Winter Steelhead isn’t an expensive endeavor, but there are many small pieces to the puzzle. Once you have a decent float rod, reel, line, and a few pieces of tackle, you are on your way to do well. I have listed out the most important aspects of float fishing in this article and hope it leads you to success! I use 9′ spinning rods for Steelhead float fishing from my drift boat. The Winter Steelhead Float Rod is probably the longest fishing rod you will ever own. A longer rod will allow you to easily pick up and mend the line to offer the most naturally free drift. 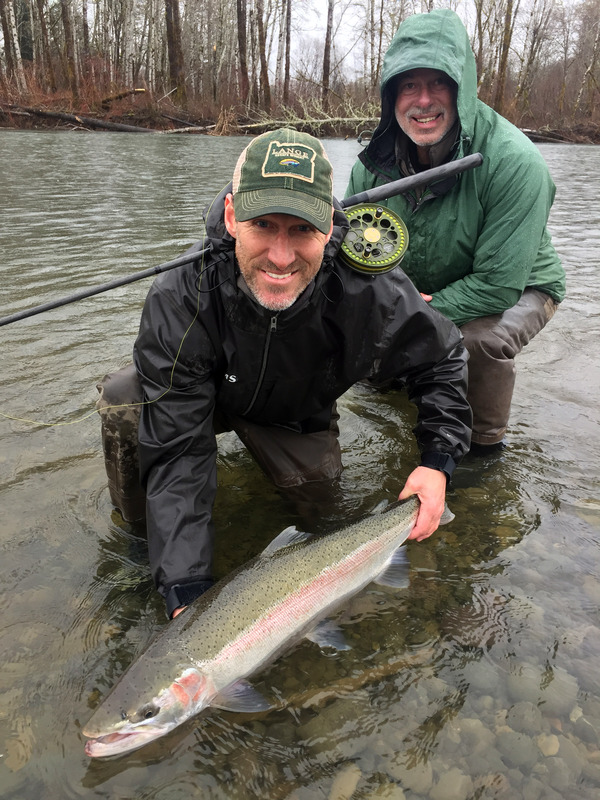 When fishing a larger river like the Skykomish, Snoqualmie, Skagit, Wynoohcee, ect, I think you can’t go wrong with a 9’6″ to 10’6″ rod. 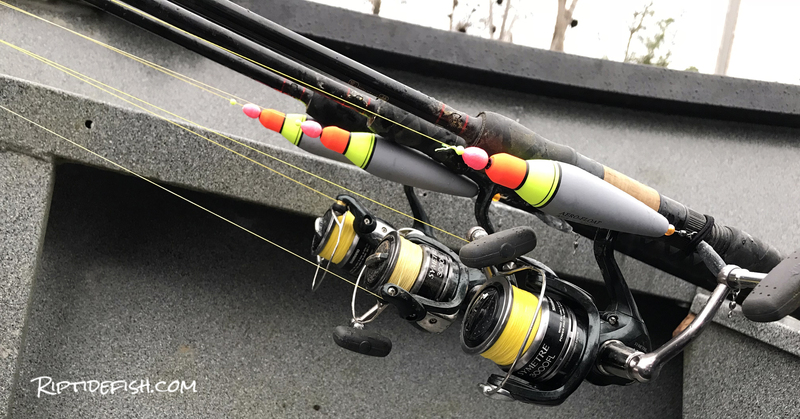 If you decide to go to a smaller stream a longer rod can be a hindrance and I would probably bring an 8’6″ to 9’6″ rod, to avoid overhanging tree branches or back brush. It is completely your choice on whether to fish with a bait-casting or spinning reel. I usually prefer a bait-casting reel because I can easily put the reel in free spool to manage the line. But when I get a bobber down it’s easy to just start reeling into the fish! However, when using extremely light tackle, a spinning reel can be easier to make the cast. 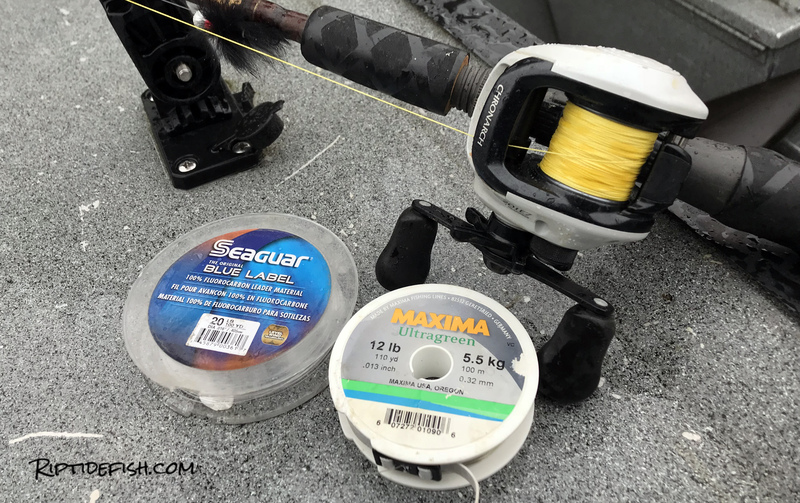 I love Seaguar fluorocarbon for leader but it is a bit expensive. Maxima Ultragreen is a great alternative. Line and leader choices are important for Winter Steelhead float fishing. The leader connects your float weight to your jig. I use fluorcarbon for easy tying and low impact, usually 12 lb to 20 lb test. It is extremely important to use a floating braided line like Power Pro or Tuffline for your main. The perfect braided main line is 30 lb to 40lb strength, but that is still very thin compared to a monofilament equivalent. The goal is to allow the bobber/jig rig to float as naturally as possible with the river current. A floating braid will allow you to manage and mend the line to offer the most free flowing drift down the river. There are countless varieties of bobbers, but here are a few of the ones that I have come to trust. You can’t go float fishing without a float! Or bobber, whatever you want to call it. I prefer a 3/8 oz to 3/4 oz bobber for almost all of the rivers I fish in Washington State. If the water is extremely clear and the Steelhead are skiddish, I will rig up a clear plastic bobber. There are too many jig options! This Aerojig 1/8 oz hackle jig is a great one. Whether you tie or you buy, there are plenty of great patterns that will put you into your next Winter Steelhead. I am an avid bobber and jig angler, and I have several boxes loaded with great patterns. When I have the time and motivation, I sit down at the tying vise and whip up a few of my favorites for the next trip. But I also have several go-to commercial patterns that I will never hit the river without. Aerojigs hackle patterns are phenomenal, as are the Yakima Baits Maxi Jig, John’s Jigs and Beau Mac. My Winter Steelhead jig boxes, a good assortment of sizes, patterns and colors. When I am fishing in normal water flows, I like 1/8 oz jigs in pinks, oranges, whites. Don’t forget about the mega-popular Nightmare pattern. If river conditions are low and clear, I will switch to a 1/16 oz pattern in the same colors. But occasionally moving to more subtle colors like black, purple and blue. When I want to try something other than a Steelhead Jig, these are a few of my favorites. The Steelhead Jig has historically been the most popular choice for float fishing, but there are many great alternatives. Beads closely imitate a salmon egg, and their profile can offer a big time advantage when jigs just won’t cut it. A small cluster of cured salmon roe, a sliver of raw grocery store prawn, or a fresh sand shrimp are all great baits to bring with you to the river. Yarnies, which are a few tufts of yarn trimmed into the shape of an egg pattern, are another great option for float fishing. Does the shopping list ever end?! 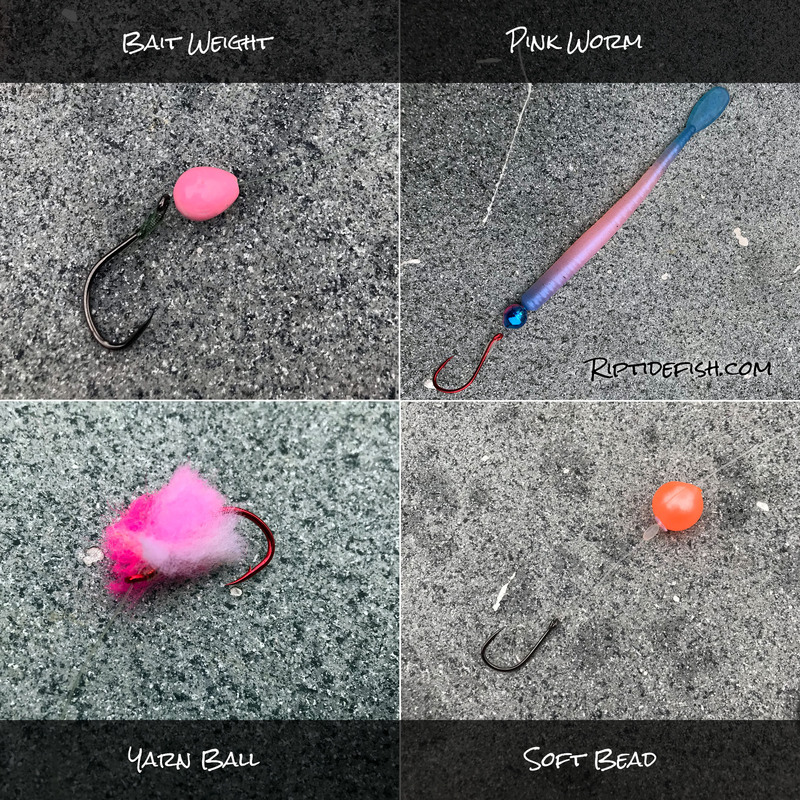 The other important tackle you need to catch Steelhead with a bobber and jig are the following…. Steelhead bobber weights. Match the float size with the weight. You will always use a float that has more buoyancy than your offering can weight down. All bobbers have a colored top that allow you to see it. You want the rest of the bobber to be sunk below the waterline. This allows you to mend your line without jostling your jig or other presentation, because it is anchored in the water. You want to have added weight to sink the float down so that it is anchored. I use 3/8 oz to 3/4 oz bobbers most of the time. Jigs are usually 1/16 oz to 1/8 oz and you need to add more weight so that the float anchors. I will match my float weight with the bobber. If I am using a 3/8 oz bobber, I will use a 3/8 oz float weight. Then even with the jig you will have the bobber appropriately submerged. 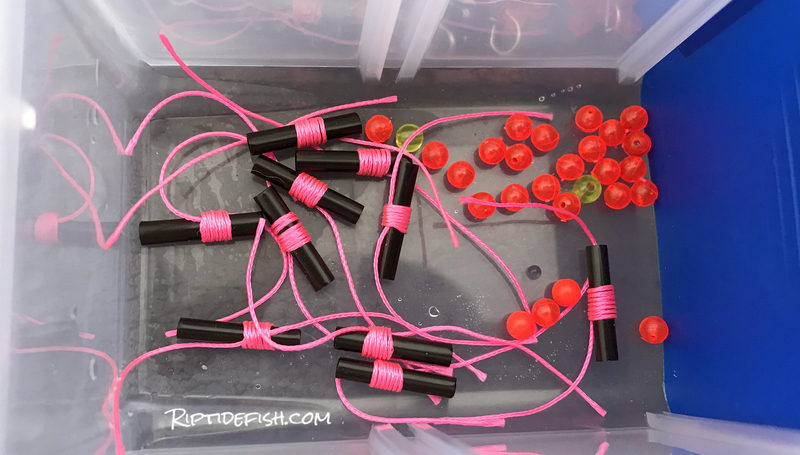 Steelhead Bobber stops and beads. I prefer a sliding float, and a bobber stop is used to regulate the depth that the jig is fished. Most sliding floats have a wide enough hole that requires a small bead to stop the float from sliding past the small string stop. Split Shot is an important item to have with you. Split Shot can be crimped midway on your leader to help get your jig down into the strike zone. Beau Mac Bait Weights are a great addition when float fishing with bait, Pink Worms or yarn. If you want to try something other than a jig, such as a yarnie, egg cluster, or sand shrimp, you can add a bait weight. It allows your presentation to dredge! This is not mandatory, but some of the best Steelhead fishermen I know love these. 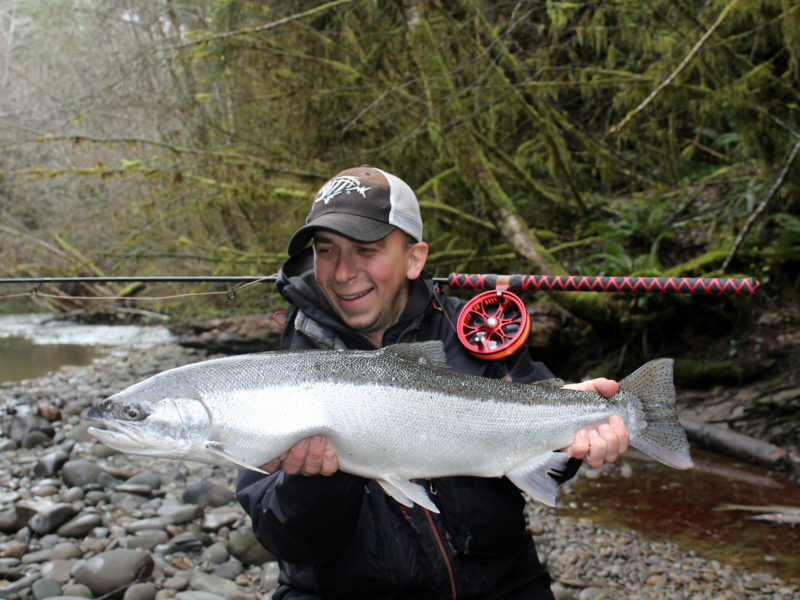 Winter Steelhead Float Fishing Success! I hope that you are now sold on the technique of float fishing for Steelhead. Now it’s up to you. You need to have focus and spend time to perfect the art. Every hour on the river will give you that valuable experience to become a great float fisherman. Get out there! Legendary guide Ray Vermillion of Lucky Strike Guide Service and his client with a Winter Steelhead caught on a float setup.